We try and stock a good selection of violin strings from 1/4 size to 4/4 and in different qualities. If you like a particular string and don't see it here please contact us and we will try to add it to our stock. Note - A full size violin string will fit on a 3/4 size violin. 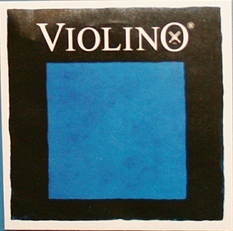 At a pinch you can use one on a 1/2 size but we do recommend the correct 1/2 - 1/4 size strings for the smaller violins. We have tried to acurately describe each string here. Try Violin String Review. to get a second opinion. Free "First Class Post" Delivery for all complete sets of Strings. 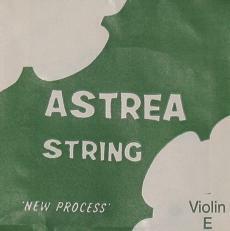 Astrea - Student quality violin string. These are steel cored and stay in tune very well, ideal for the beginner who cannot tune the violin from lesson to lesson. For 1/2 size and smaller violins. 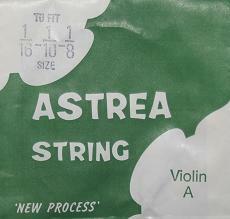 Astrea - Student quality violin string. These are steel cored and stay in tune very well, ideal for the beginner who cannot tune the violin from lesson to lesson. For 1/8, 1/10, 1/16 and smaller violins. 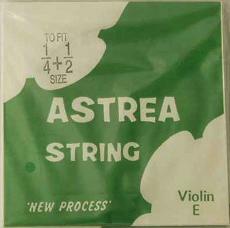 Astrea - Full size version of these popular strings. Complete set G,D,A,E wound on a steel core. Very long lasting and stay in tune very well. This set is suitable for full size and 3/4 size violins. 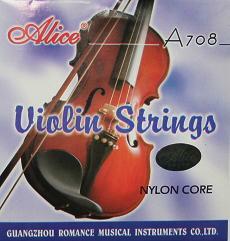 Alice A708 strings are a Nylon Cored budget string that produce a much more mellow sound than the usual steel strings at this sort of price. Made from high quality materials imported from Japan and Germany and made in a high tech factory in China these strings represent exceptional value for money. Yes you get two E strings with every set. 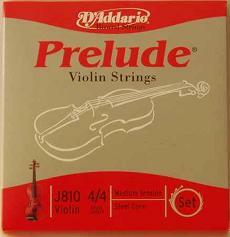 D'Addario Prelude for 3/4 size violins - Good quality Steel cored strings that give a quick bow response with a clear bright tone without the shrill sound of traditional solid steel cored strings. Very durable, packed in a special plastic bag that prevents corrosion so you can keep spares in your case for years. Excellent for students and a wide variety of playing styles. 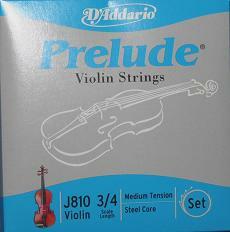 D'Addario Prelude for 1/2 size violins - Good quality Steel cored strings that give a quick bow response with a clear bright tone without the shrill sound of traditional solid steel cored strings. Very durable, packed in a special plastic bag that prevents corrosion so you can keep spares in your case for years. Excellent for students and a wide variety of playing styles. D'Addario Prelude - Good quality Steel cored strings that give a quick bow response with a clear bright tone without the shrill sound of traditional solid steel cored strings. Very durable, packed in a special plastic bag that prevents corrosion so you can keep spares in your case for years. Excellent for students and a wide variety of playing styles. 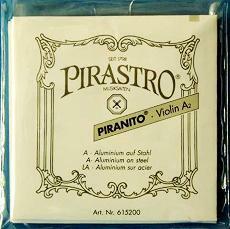 Pirastro Piranito - Good quality Steel strings, ideal for smaller violins where their brightness compensates for the rather quiet sound of the smaller instruments. Long lasting and very pitch stable. 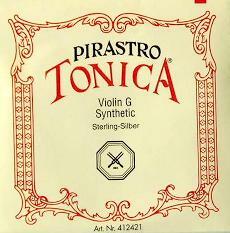 Thomastic Spirit Strings 4/4 described by Thomastic as strings for amateurs and aspiring music enthusiasts. They are based on a composite Nylon core wound with Aluminium winding on the A and D strings and Silver on the G. The E string is steel with a tin plating. They take a day or two to settle down and for a while they have a rather metallic edge (a bit like Dominants) once that passes they are very warm sounding and seem to suit many of the Chinese student violins. Pirastro Tonica - metal wound on a Nylon core. In our opinion this string is marginally better than Dominants. We are using them on some of our better Chinese violins as they have a slightly warmer tone. Highly recommended. 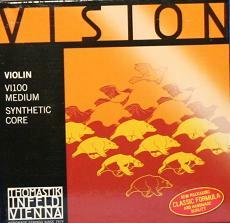 Thomastik Vision Strings. Made with a synthetic composite core, the G and D are silver wound, the A Aluminium wound and the E is a multilayered steel wire, tin plated. They are reputed to create a rich complex sound and to settle in very quickly. 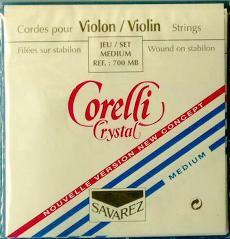 Corelli Crystal - Very popular French Made string, metal wound on a stabilon (Nylon) core. Very similar to Dominant strings with a warm sound and quick bow response. Settle down very quickly after fitting and they are very durable. 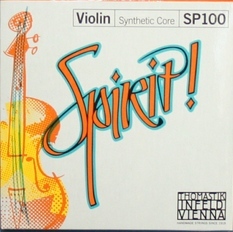 Excellent Student String for better violins. 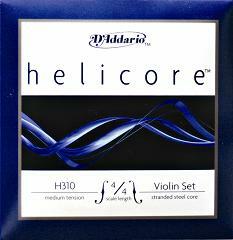 D'Addario Helicore Violin Strings. Multi-strand twisted core strings superb for the advanced and professional player. The small string diameter provides quick bow response. Using special manufacturing techniques these strings have a warm clear sound with excellent pitch stability and longevity. Coupled with a short break in time you have one of the best steel strings available. Pirastro Violino. New strings from Pirastro that produce a warm round sound with low tension. They are very well balanced from string to string and settle down very quickly after fitting. They are very pitch stable and not much affected by changes in temperature or humidity. If you're looking for student violin strings which produced a warm and round tone, so often missing in most steel core strings, then Pirastro Violino violin strings are highly recommended. 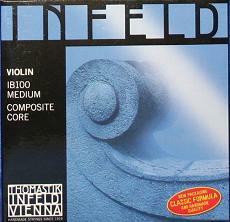 Thomastik Infeld Blue set. High quality strings suitable for Orchestral use. Full sound with a good dynamic range. New strings settle quickly and stay in tune well. The Blue set produces a more focussed and brighter sound. 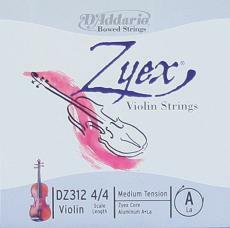 D'Addario - Zyex - Based on a core of space age material Zyex strings have the shortest break in time of any synthetic cored string. They are very pitch sensitive and produce a very clear tone. A little metallic sounding for the first day or two but then produce the warmest sound of all synthetic strings. 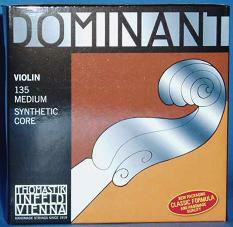 Thomastik Dominant - Probably the most popular string in the world and thought by many to be the best. We use these strings on most of our better quality violins because they seem to produce the nicest sound. Not cheap but they last for ages and do sound nice. Don't forget FREE FIRST CLASS postage on complete sets. 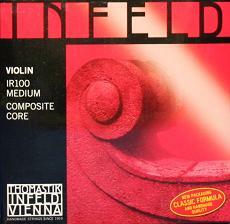 Thomastik Infeld Red string set. 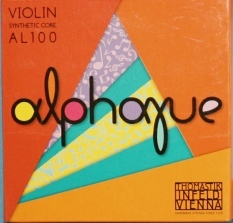 Very popular strings giving a large full sound and very good dynamic range. New strings settle quickly and stay in tune well. The Red set give a warmer darker sound on most violins. 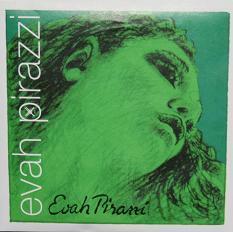 Evah Pirazzi are considered by many to be the best of the Pirastro range of strings. Based on a unique synthetic core they are more powerful and bright than other synthetic cored strings. They are reputed to have the widest possible dynamic range, outstandingly quick response and a solid warm tone. Certainly a very nice string and many professional players swear by them. This set includes the gold plated E string rather than the silvery steel one. 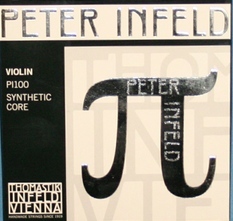 Thomastik Peter Infeld professional strings. Thomastik describe these as - A perfect blend of power and elegance with a rich spectrum of sound colours and a high dynamic range. The E string is Chrome steel plated with Platinum. The A string has a multi-stranded sythetic core wound with Aluminium. 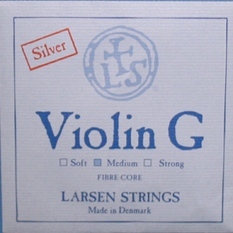 The G and D strings are similar but wound with Silver tape. These are very upmarket strings and probably the best made set of synthetic cored strings around. One reviewer described them - I used them on 2 violins and these strings make the instrument sound deep and "adult".